The last few days have been particularly hot in Melbourne which has meant that we have spent a lot more time inside than usual. Finally having some time on her hands, Goose has been an insatiable craft fiend. She was given the book Little Things for Busy Hands by Katie Evans last year for her birthday and it has been getting a very good work out! It’s a great little book designed especially for kids to use with minimal help from adults. It is perfect for her age*. In no time at all she had whipped up frog purses for each of her siblings, a monster puppet and, with a bit of help, a pink pony softie for her little sister. She’s planning on making the fabric mat next. Here are some photos of some lavender cocoons that she made from the same book a couple of months ago. All you need is a some lavender and some fabric strips or ribbon. The long thin type of lavender would work much better and would end up with a lot neater finish, but this is just what we had in our garden. Not necessarily the neatest, but great tucked away in the undies drawer or hung in your wardrobe. I hung these ones up near the Christmas tree last month as I thought they were a little bit festive. There are many many tutorials in blogland for the lavender cocoon (or lavender wand as they are sometimes known), all of which use ribbon and not fabric and are really, really neat and perfect. I like the look of these ones though. Something different. Here is one of those tutorials with simple step by step instructions. While we are on the topic, another lavender craft that makes a great little addition to the undies drawer or a gift for Grandma, is the lavender sachet. The lavender sachet is a basic rectangle shape, two pieces sewn together inside out but leaving a gap, the right way around, then filled with dried lavender and hand sewn together. Here is a tutorial if you’d like something more detailed! Or here is a simple & cute hand-sew tutorial for younger kids to make. 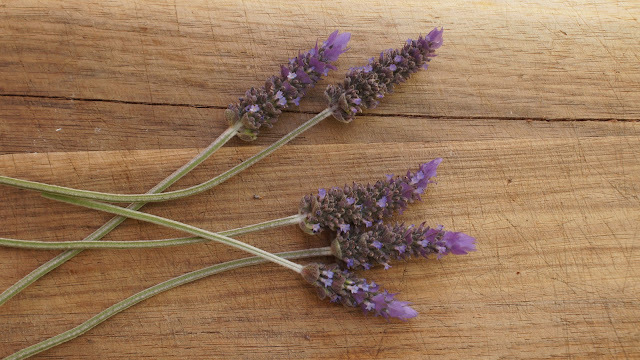 Just like lemon trees, lavender seems to be a staple plant found in gardens all across Australia. No doubt due to the fact that it is a hardy plant that requires little water. Do you have a lavender plant at your house? Do you love the smell or does it give you a headache? Have you used lavender in your crafty projects? Head over here for more FGB Kids Craft Ideas to occupy your kids during the holidays. * Goose is nearly nine years old. We make our own alfalfa sprouts quite regularly in our house. But this time, I thought we’d try something different and purchased a mixed sprout packet. Here’s the method that we use, if you’d like to give it a try. It is very simple and takes only a couple of days to have your own homegrown sprouts. Sprout seeds can be purchased from your local plant nursery or health food shop. 1. Put sprout seeds into the jar and cover them with 1-2cm of cool water. 2. Cover the top of the jar with a piece of tulle and secure with rubber band. 3. Allow the seeds to soak overnight, then gently drain off the water. It is important to drain the water off using the tulle as a seive to keep the seeds moist but not covered in water. You might need to hold the tulle in place as you drain as the rubberband has a tendency to slip off if you are not quite gentle enough. 4. For the next few days, rinse the seeds in the morning and evening by covering the seeds with some water, swishing the seeds around, and draining them straight away. 5. Repeat until sprouts are ready to eat. Usually 4-6 days depending on season. The hotter the weather, the quicker they’ll grow. Some people suggest that you need to store the jar away from direct sunlight as you grow them, but I have always grown mine on the window sill and I’ve never had a problem. Once grown, your sprouts should last at least 2 weeks in an airtight container in the fridge. We used these mixed sprouts in a salad and although Granny loved them, they were not a particular hit with the kids. The kids do love alfalfa sprouts though (or ‘worms’ as they are affecionately known here) and they are a common ingredient in sandwiches here. Alfalfa sprouts are grown using the exact same method above and even if you don’t like to eat them, I highly recommend it as a fun experiment to do with the kids. You could make your own egg creatures with alfalfa sprouts. You could make your own sprout growing kits as Christmas gifts. We made sprout growing kits as a MOPS activity earlier in the year also. You could even put a mini sprout making kit inside a bon-bon/cracker like we did last year. Do you grow your own sprouts? My personal favourite for a healthy snack is kavili or toast with cream cheese and flavoured tuna with alfalfa on top. As has become a tradition at our house we’ve been experimenting with a few early spring Snowdrops. 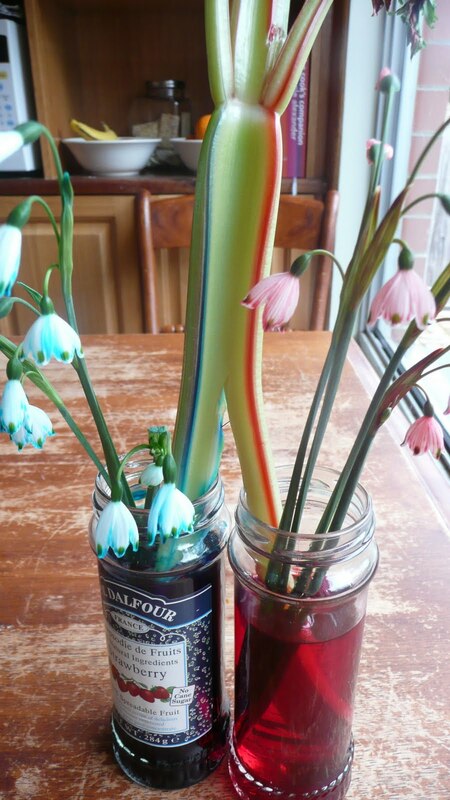 Popping them in food dye and waiting for the colour to travel up the stem to the petals. Never gets old. It also works on celery and apparently with carnations. If you are after some more fun outdoor winter crafts you can find two more Frog, Goose & Bear tutorials on Kidspot for Fairy Garden Terrariums & Fizzy Chalkpaint. There is now a Frog, Goose & Bear facebook page if you’d like to keep up to date with all things Frog, Goose & Bear. Olympic Opening Ceremony tomorrow!! Might even have to get into the spirit and get the kids hyped by printing up some these adorable Olympic Printables from Tinyme. What should I do with my hundreds & thousands of sweet & ripe mini mandarines that are growing on the two trees in our front yard? Do you have any recipes to share? I can’t think of a single one, so we’ve been eating them by the bucket load and giving away bags full every day. Hundreds remain. Do you say mandarines (man-dah-reen) or mandarin (man-dah-rin)? Is it an Aussie thing or a state thing? Or am I in the minority having called them mandarines for my whole life? After typing it in the latter way, it seems there are quite a few out there after all that might be worth a try! *That last pic is of the most recent fairy garden. At MOPS last week we had a lovely guest speaker from our local community health centre on the topic of ‘active play’. I came away with many ideas to add to the arsenal, but the following was my favourite. We walk home from school when I can be bothered most days. It’s only about 700m from our house to the school but it is uphill all the way there and although the kids are normally full of energy sometimes when you are 2 or 4 years of age, it can feel like a long way. It would take me 10 minutes on my own, but we like to allow ourselves 30 minutes and even then we sometimes only just make it as the bell rings! As much as I’m into promoting exercise, I often end up taking Frog in the pusher because we just need to get there! When I pulled out this activity she was out of the pusher in a flash and happily walked the whole way to school in no time at all! It has been such a beautiful sunshiney week here in Melbourne and the multitude of flowers springing up in the gardens on our walk to school made this activity quite a hit…..with the girls anyway. Goose, Frog and I got right into it, but after one or two flowers Bear had had enough and promptly sat himself down in the available pusher. Wrap a piece of duct tape or masking tape around your child’s wrist with the sticky side on the outside. 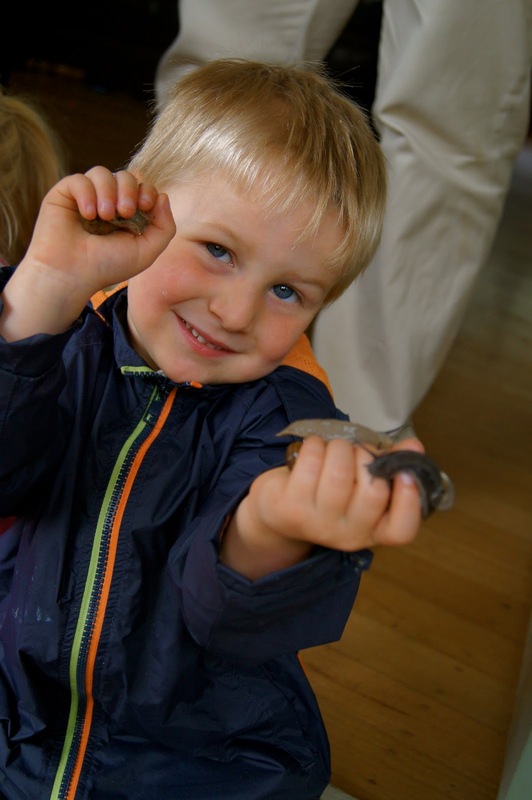 * Then get them to stick on any ‘nature’ that you find on your walk, like leaves, flowers, seed pods, etc. Click here for more ideas to amuse your kids. * Not too tightly – we don’t want to cut off circulation or anything of course. 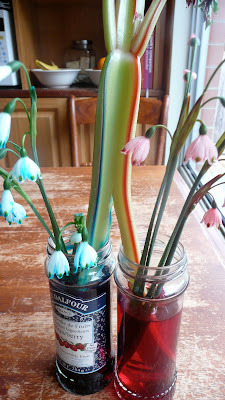 This time last year, we were experimenting with food dye* and spring bulbs! For details re the experiment, see last years post here. Since then, thanks to some helpful bloggy comments we’ve tried the same trick with celery as you can see in these photos! How cool does it look as it goes up the stem? Red up one side, blue up the other until it combines to purple at the top! You can rewind over here too. Or check out some more ways to entertain your kids here.